Update: Some commentary on other sites linking here seem to be under the impression I was the one who limited the range of George Zimmerman’s elbow in the following analysis. As I stated in the post, the placement of his elbow on the ground and next to his side is Zimmerman’s testimony during questioning. It is also part of George’s ‘tell’ when he fabricates – he drifts into ridiculous details. You can release George’s elbow from where he anchored it and the bullet trajectory still won’t work. Remember, poor George was fighting for his life against a superior opponent [/sarc]. If you allow more degrees of freedom, it does not help Zimmerman in terms of trajectory path. Any attempt to bend the wrist into the line of fire weakens the grip on the gun and the force on the trigger. If the elbow is out or the arm back enough to aim straight in, then the person on top could push down and away on the arm and force the gun away. This is the benefit of being on top and having the ability bring all your weight to bear. There has been some interesting reporting on the Trayvon Martin murder case this week, reporting that once again points to the conclusion George Zimmerman is NOT the poster child for 2nd amendment gun rights, but is actually the poster child against personal gun ownership. And the sooner the pro-gun, 2nd amendment movement dumps Zimmerman to pay for his crimes, the better off responsible gun owners around the nation will be. I ma pro gun, and Zimmerman is the example of what every decent gun owner would never do. Zimmerman confused the right to self defense with a right to harass, chase and confront a law abiding person he felt like harassing. He wanted to play policeman, but nearly all knowledgeable gun owners know that carrying a gun is not a license to play cop. No one has any right to stop, harass, threaten or impede another citizen. The only people authorized to stop, search and question a citizen are the police. Even then the police are constrained by a myriad of protections for the lawful citizen (who is innocent until proven guilty) and must be trained and certified to handle a confrontation safely. Not even armed guards can go beyond the property they are protecting and reach out and disturb others on a whim. Gun ownership is a serious responsibility. How do Zimmerman and his blind followers think otherwise is a real mystery. But they do – and they are wrong. Trayvon Martin was armed with a cell phone, tea and skittles. And he was under age. No adult had the right to impede him, and anyone dumb enough to try would have been open to the protections provided minor children against threatening and/or dangerous adults. Given his efforts to get away from Zimmerman, he was clearly AVOIDING confrontation. He did so numerous times. Zimmerman, who chased and hunted Trayvon, was clearly PUSHING the confrontation (and admits so on the 9-11 tapes). A man who stalks a child, and then finds that child fighting back (and likely winning), cannot then use self defense and kill the stalked child if events go against him. Law of the land – for obvious reasons. I must point out that the last bullet is not conclusive and most likely wrong, and it will backfire on Zimmerman’s case. As presented in this story and accompanying video, a simulated firing against test clothing shows nothing more than a 3″ gap between the hoodie and Trayvon’s chest. That is the only sound conclusion. The jump to the uninformed conclusion that this 3″gap means Trayvon was sitting astride Zimmerman, with his shirt hanging down is wrong. Demonstrably wrong. With the elbow on the ground the arm can bend as shown, and only as shown. Now, let’s put an assailant on top of a victim, straddling the stomach with knees up into the armpits (again, this is direct testimony of George Zimmerman) leaning over Zimmerman so he can push/bash his head against the ground. This is the style of MMA fighting mentioned by one of the witnesses who saw the two on the ground. Notice where Zimmerman’s gun would be located if he was on his back. It has to be on the hip on the backside, firmly pinned to the ground and captured in his holster under his shirt. How do we know this is where Zimmerman wears his gun? Because Zimmerman illustrated this in his crime scene walk through. The guy on the ground in this picture could never pull a gun from this position. I want everyone to pay very close attention to the angle of the arm and the possible trajectory paths (yellow arrows). 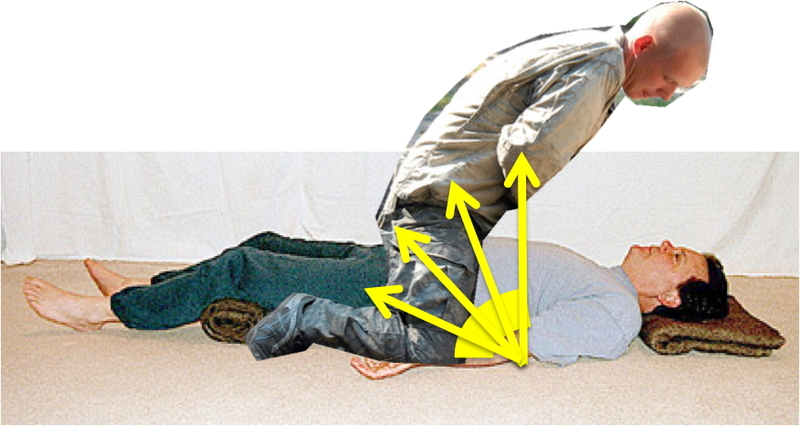 Any shot from the position described by George Zimmerman would enter low and go upward into the chest cavity. You cannot hold a gun and bend the wrist down and fire to level off the gun (try it). The arm, wrist and trigger finger won’t work, and it would push any lose clothing up against the chest. So you cannot get a trajectory front-to-back with elbow on the ground, you can only get one from lower front to upper back. This is the only mechanically possible shooting position that matches the trajectory of the gunshot wound (and the test firing scenario) and the mechanics of arm, wrist and elbow. It is so obvious Zimmerman did not shoot from his back as to be blinding. So, how does one get the hoodie 3 inches away from the chest in this position. Easy. Zimmerman is holding Trayvon by the hoodie, Tryavon is trying to pull away. As Trayvon bobs back and forth trying to back away (as Zimmerman’s gun is now out and pointed at his chest and he is yelling for help), the gun goes off. Zimmerman’s efforts to hold Trayvon by the hoodie pull it away from the body. It is just one of many scenarios that do fit the trajectory path, entry pattern and wound. but one thing is for sure, there is not trajectory that works with Zimmerman on his back, elbow planted on the ground, as he testified. None. Can’t do both at the same time. Zimmerman is oblivious to the mechanical limits of the arm, elbow and wrist. Just as he was oblivious to these constraints when he concocted the entire shooting story. And the fact his timeline, distance and story don’t line up is not a surprise. None of it is. He lied to cover up the fact he stalked, got into a fight, and then killed an unarmed innocent kid. After all, he’s lying for his life right now. The fact Zimmerman went farther (or lurked longer) than he admitted is probably due to the fact he was the one hiding. And after Trayvon thought the coast was clear and resumed his evening stroll and talk with his girlfriend, it was Trayvon who was probably ambushed. Zimmerman had enough time to go the “T” and his truck probably 4 times over between his first call and the 9-11 call with the shot fired. So what was he doing all that time? Playing cop? Addendum: I watched the video of the simulated firing again and noticed one other problem. The pattern of gunshot residue on the inner shirt (representing the chest) is a symmetrical circle. That is because the test firing has the gun perpendicular to the chest – straight on. But as I showed above, there really is no way to shoot straight into the UPPER chest from the position Zimmerman claims to be in. 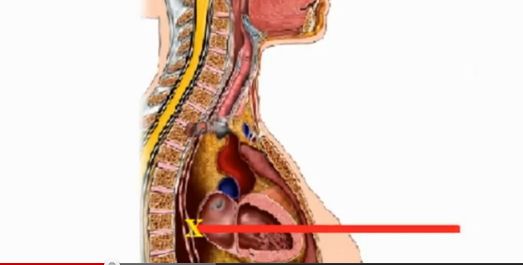 In that arrangement, the residue would be angled, with smaller dispersion below the wound and it elongated above, to more accurately reflect the possible shooting angles depicted in yellow above. The stippling pattern on Trayvon – circular. Also indicating a straight on shot..
Again, this physical difference between the yellow and red trajectories is damning. There is no way Zimmerman’s testimony (including the part were is elbow is on the ground) works with the evidence. It doesn’t seem you make allowances for the flexibility of the wrist. raise the your arm/hand as if holding a gun (feel free to use your index finger to represent the barrel), and then try and lower the wrist to get so the finger points near 90 degrees off the arm. Uncomfortable and awkward. Almost like a wrist lock move. Now try and squeeze the trigger finger. Very hard. That position is wide open to having the gun pulled out of your grip. Not a likely position. And the barrel would be pressing to the skin- not 3″ away from someone on top. I am not your average low IQ lame brain usually selected to sit on Juries. My IQ is at least 1 and 1/2 times that of the average person. If I were sitting on the jury, none of this specualtion and reenacting of “what ifs” would make a difference to me. All I can see is that the back of Zimmerman’s head was all banged up where it wqas banged against the sidewalk (which took two of Treyvon’s hands) and the autopsy showed the only injuries to Treyvon was skinned up knuckles where he had been hitting someone or something, and a bullet hole. This indicates that Zimmerman did not attack Treyvon physically. You also have the witness who said he saw Zimmerman on the ground with Treyvon on top of him banging Zimmerman’s head on the ground or sidewalk, and Zimmerman was yelling for help. I would not put too much credibility int he testimoney of the so called girl friend who claimed to be talking to treyvon on the phone “and heard it all.” She has claimed it was Treyvon who was callign for help instead of Zimmerman. Since Treyvon did nto have any injuries that indicated anyone was attacking him why would he be calling for help? The fact is that Treyvon was over 6 feet tall and looked and acted like a man. All this talk of Skittles and tea does not alter the fact that Zimmerman did not know he was a “little boy” as you would have us believe. Treyvon obviously had to use both hands to bang Zimmerman’s head on the sidewalk so your theories about Zimmerman’s claims do not hold water. You dont’ know what you would do if you were in t he same position as Zimmerman found himself. I doubt even Zimmerman knows every move he actually made. Maybe he managed to roll over a little and get his gun. Who cares. A witness says Zimmerman was on t he ground and Treyvon was on top of him banging in head of the ground or sidewalk. Then zimmerman managed to get his gun out and shoot h is attacker. If someown was trying to bash my brains out on the sidewalk, I would do w hatever was necessary to save myslef. Unless you can give me something other than pie in the sky specualtion, I’d still vote for acquittal on the basis of the physical condition of both men. Zimmerman’s heat showed signs of being bashed on the sidewalk and Treyvon’s only injuries were skinned up knuckles. It doesn’t take a rocket scientist to see who was doing what to whom. Thank you AStrata, great article your analysis spot on. I for one totally agree, common sense is not hard to understand. There are those who are determined to be right, will dismiss anything and everything regardless how much science and sense it makes. All swept aside just because they can’t admit err, let alone dispute your research with research of their own of science, facts and figures. Also, when GZ walked Serino through crime scene and realized how far away he was from where Trayvon’s body was found he tried to make up the difference of distance. Didn’t work one bit, there would have been much more mud, debri, grass stains on his clothing, no way he scooted that far from the top of the T that far down to where Trayvon was found. He say he tried to push him off and where he said he fell and shot Trayvon was NO WHERE NEAR WHERE TRAYVON’S BODY WAS FOUND — NO WHERE!!!! Caught on tape, you got pics of the vid with Sir Lie Alot reaching across his body for a gun that was behind and underneath him. momdear1….its nice to hear of your high IQ but either you haven’t read the evidence or your spreading lies for whatever reason…Trayvon’s knuckles were not skinned …go re-read the autopsy report and use that intelligence you brag about ….Trayvon was 5′ 11″ tall not over 6’….the injuries to the back of Zimmerman’s head are inconsistent with being bashed into concrete multiple times…its also very telling Zimmerman has no defensive wounds….Zimmerman’s own words are going to be what convict him imo…. 6) DeeDee’s testimony IS RELEVANT and PLAUSIBLE. Why does this girl need to lie. 8) Nobody is claiming Trayvon was a “little boy”, he was a teen and GZ noted that in he NE dispatch call. 9) Then zimmerman managed to get his gun out and shoot h is attacker…exactly “HOW” was GZ able to get his gun out…AJ’s depiction is CLEARLY PLAUSIBLE. 10) Unless you can give me something other than pie in the sky speculation…considering you opinion is CLEARLY DEVOID of facts or logic and I have provided actual evidence to dispute your opinion, I believe I’ve proven you’re lacking the critical thinking skills to be a juror. AJ – great job at owning nutters! Trayvon was actually 5’11″…still under 6′. if I showed you to be inaccurate about some pretty serious claims that you have made in the answer above, would you reconsider all your other claims? @Tzar it would not matter one bit, that person has already put down those of us who sit on juries, leading others’ to think she already believes she is better mentally than others’. If she were to be on the same jury as myself, I would shut that attitude down with a quickness. Just reading that post you can see there are ‘blinders’ not able to view fact from only injuries of the tragedy. It takes much more to make a reasonable decision. Yet only to focus on the injuries and a phone call that is documented time stamped with accurate testimony matching the time stamps. For goodness sake. Many do not use Science and Technology, instead Tinfoil Technology is working in their bubbles. I strongly believe there will be more evidence, witnesses, recorded audio, and recorded video to be released at trial. Just as the surprise infamous 2nd passport and jailhouse conversations of GZ and Shellie plotting and lying that blindsided O’Mara. Ha! GZ did more than follow a teenager, he pursued him. Automatically putting one in fear to fight back for their own safety. GZ was to watch, report and wait, not follow and go looking with his Tactical flashlight(S) and gun, that is not what Block Watch is about. Keep in mind that this pistol involved is a very small 380 kel tec. (If I recall correctly). A very short barrel. It takes only a tiny angle of refraction to influence the arc of the line of fire. Given nature of most street altercations Its hard to pin down actions as though its some graceful pre-planned event. While Trevon was legally classified as a “child” in some states. His strength and stature where that of a man. I deal with these street tough types every day and they will take you down to the grave in a heartbeat without any remorse. His strength and stature where that of a man. LMAO, how would you possibly know that? Given nature of most street altercations Its hard to pin down actions as though its some graceful pre-planned event. luckily we don’t have to pin down the actions of the fight, The killer did that for us. Try to remember that the logistics and forensics were worked out from his testimony”. Momdear 1, prosecution sure don’t want me on the jury, I’m with you, that’s two to acquit. Folks – so sorry for not checking the comment moderation queue! It has been so long since I had new readers I totally spaced checking to see if anyone commented. My sincere apologies to everyone. Reporters asked: Will you charge the 19-year-old Miami woman with perjury? The woman had told prosecutors she was in the hospital on the day of Trayvon’s funeral. “In fact, she lied,” defense attorney Don West said.